Last week, HEJM received a response to our February letter of concern that we sent to MnSCU Chancellor Rosenstone and other community stakeholders. We appreciate the opportunity to engage in meaningful dialogue about the issues of racial equity, student achievement, and fair working conditions for protected class employees across the system. In that spirit, we have crafted a series of bullet points that we encourage concerned community members to consider as we move forward in this conversation and take concrete actions in order to right ongoing and historical wrongs that continue to negatively impact some of our state’s most vulnerable citizens – many of them students at MCTC and other MnSCU campuses, and all of them taxpayers whose monies pay the salaries of those appointed to work on behalf of all Minnesotans. In his response, Chancellor Rosenstone states that our request to remove MCTC President Phil Davis and his senior leadership team is inappropriate, because it is based on feelings and perceptions about certain individuals, rather than concrete facts. We could not disagree more. In fact, the MCTC faculty union (MSCF), as well as the Minnesota Association of Professional Employees (MAPE) have had a Vote of No Confidence in MCTC President Davis and his senior leadership team for over a year now. These are collective bargaining units that are often the only recourse that the citizens and workers of Minnesota have to voice their approval or displeasure with their labor conditions, and the ability of its designated leaders to collectively organize said workers to achieve the institutional mission. That MCTC administrative leadership, and now MnSCU administrative leadership, would simply dismiss the valid concerns of a large and representative group of professionals as “personal” shows just how out of touch this leadership is with the majority of workers and students throughout the system. Additionally, the fact that there are an incredible 48 interim positions throughout the college – meaning, the individuals who have these administrative, staff, and even faculty positions were hand-picked by the Davis administration, that there were no open or national searches, or in most cases, search committees – is cause for alarm. Chancellor Rosenstone also encourages HEJM to examine the “Charting the Future” document that MnSCU stakeholders have put together, in an effort to imagine where the system should be headed. HEJM members are already engaged in this discussion, and we can say that there is a pattern of dysfunctional colleges and college leadership throughout the state, whose constituencies now recognize that “Charting the Future” also means changing leadership. Rosenstone is making the assumption that those in the leadership have nothing to do with student success, which is faulty logic. HEJM finds many of the statistics Chancellor Rosenstone quotes in his response problematic, without context, and quite likely, also just plain wrong because MCTC administrators have manipulated data in the past. This gets to the deeper problem of lack of transparency throughout the system, and the attendant lack of trust it fosters at individual campuses and communities statewide. If MCTC has 23% permanent faculty of color on staff, that would mean that one in four faculty on campus should be people of color. (And by the way, “faculty” does not include service workers and support staff who, in the past, have been included in this pool in order “beef up” these numbers.) Those of us who work and attend classes at MCTC know that this simply isn’t true, so we would ask MnSCU to ask an independent agency to conduct a quantitative and qualitative assessment of the numbers and experiences of employees of color at MCTC and throughout the system. This would go a long way in reestablishing trust, and creating an accepted shared context of what the problems are locally and system-wide. HEJM has confirmation that since 2012, more than nine faculty of color have left the MCTC campus due to the climate, and four more are slated to be terminated, due to ongoing budget mismanagement and breaking the faculty contract by President Davis and his leadership team. In addition, six high-ranking administrators of color have left the campus during the same time period. Trends like this don’t just “happen,” but are instead the result of deeply entrenched exclusionary policies, procedures, and actions at the highest levels of MCTC and MnSCU, and throughout the system. We ask Chancellor Rosenstone to commit to investigating these and other disturbing racist patterns at MCTC and throughout the MnSCU system, and to honestly and meaningfully address them, rather than continue to hide behind numbers that just don’t add up. We agree that The Power of You, Student African American Brotherhood (SAAB), and other programs and classes targeted to support those from vulnerable communities are important initiatives to increasing student success, as Chancellor Rosenstone states in his letter. However, we are alarmed that Rosenstone doesn’t know that the budgets and institutional support for these programs are currently under siege, as a result of the Davis administration’s enrollment mismanagement. SAAB just learned that for the first time, they will not be able to attend the national convention – a key component of the initiative. President Davis has effectively eliminated the leadership that made the Power of You a successful program, and is slated to replace it with more interim “leadership.” The budget of this innovative program is also not secured. Finally, HEJM has learned that many of the faculty who designed and teach many courses on equity and diversity at MCTC find that they and their courses are actively undercut by the institution. Advisers tell students not to take their classes, and classes and programs that are advertised on the MCTC webpage during Black History Month routinely do not run because administration does not like the enrollment numbers. Simply offering programs without ongoing assessment and analysis of quality and retention does nothing to ensure their longevity or effectiveness for the students meant to benefit from them. In fact, in many cases, it ensures their failure. Chancellor Rosenstone’s inability to transparently note this shows a lack of understanding of how structural racism and institutional racism go hand in hand to affect disparity rates and student attrition. 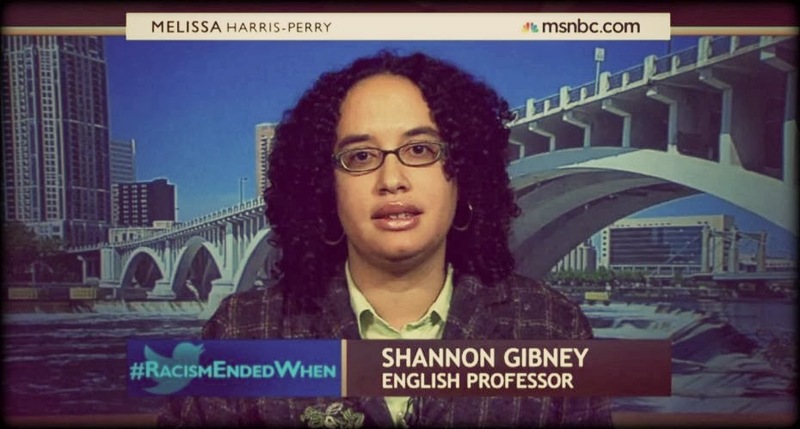 Finally, both Chancellor Rosenstone and President Davis maintain that “no faculty member has ever been disciplined by the college for teaching structural racism.” And yet, Professor Shannon Gibney was indeed reprimanded for teaching structural racism in her class. She received a letter to that end. This letter of reprimand that is now permanently in her file is proof that the college does indeed discipline faculty for teaching structural racism. If Chancellor Rosenstone and President Davis want to remain true to their word, then they need to remove the letter from her file. Although HEJM finds Chancellor Rosenstone’s response to our and the community’s concerns about equity and student success at MCTC and throughout MnSCU largely inadequate, we do appreciate the opportunity to open up dialogue on all of these crucial issues. We urge Rosenstone and the MnSCU Board of Trustees to remove MCTC President Phil Davis and his senior leadership team as soon as possible, for all the reasons we have previously articulated, and continue to demand a reorganization of the entire MnSCU structure, such that individual campus presidents and their leadership must be accountable to someone other than themselves. "It will be critical to continue to weave diversity and inclusion and equity into every aspect of MCTC’s Strategic Plan, leadership behavior, and infrastructure. In developing and modeling positive diversity leadership behaviors, it is necessary for leadership—including the President’s Cabinet and the Leadership Council –to self-assess one’s mindset about diversity and cultural differences, utilizing a certified survey instrument to measure cultural competence, expertise, and sensitivity." "Our recommendations are based on the optimistic assumption that, with strong outside support, communication about current challenges can be transformed through real dialogue worthy of a learning community." "Why the no confidence vote and the Presidents’ leadership matters to you, the faculty"
"Our call for a vote of no confidence in the leadership of President Davis is not the result of a personality, conflict nor is it the response to any recent event. Rather, it is the reluctant but determined response of entrenched, dysfunctional leadership spanning four union Presidents and numerous council members." 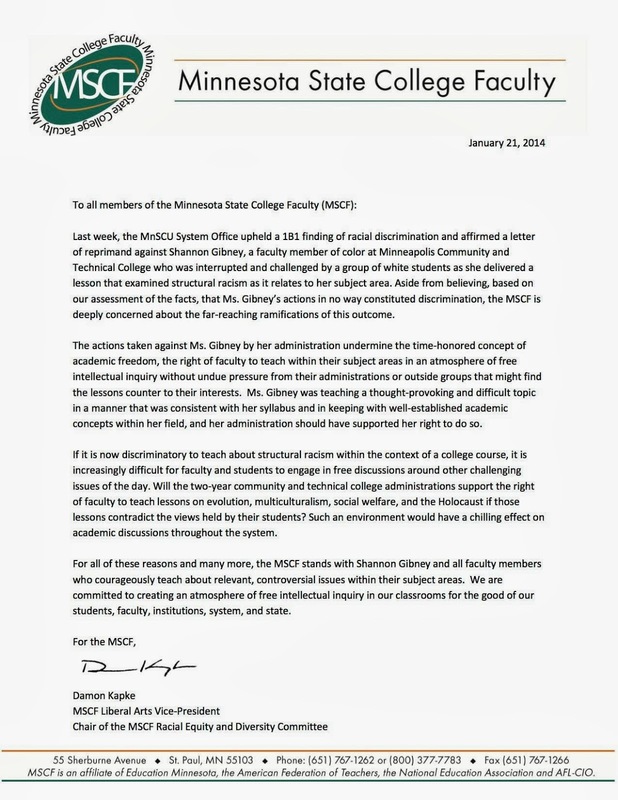 Also, if you are an MCTC student or represent an organization that would like to sign on to this letter of support, please email higheredjusticemn@gmail.com by Friday, February 14.
via CharleneSayo.com: "When Shannon Gibney, a writer, activist and Black Studies professor at Minneapolis Community and Technical College was accused of racial harassment and reprimanded soon after, her case unleashed a furious national debate beyond structural racism in post-secondary institutions as it fused all aspects of intersectionality: race, class, gender and privilege. Shannon’s uncomfortable yet crucial story—coupled with her witty, firebrand personality—clobbered America’s cracked notion of a post-racial society, bringing to the centre its legacy of colonialism, slavery, racism and the frictions of shifting race, class and gender power structures in contemporary America. Click the link below to listen to my lively conversation with Shannon about racism, sexism, access to education, anti-racism organizing, solidarity and with a little mention of Junot Diaz thrown into the mix." Read the whole thing, along with over 1100 signatures and comments, here. This week the Minnesota State College Faculty Union took a public stand with Professor Gibney and in defense of academic freedom. "If it is now discriminatory to teach about structural racism within the context of a college course, it is increasingly difficult for faculty and students to engage in free discussions around other challenging issues of the day. Will the two-year community and technical college administrations support the right of faculty to teach lessons on evolution, multiculturalism, social welfare, and the Holocaust if those lessons contradict the views held by their students? Such an environment would have a chilling effect on academic discussions throughout the system."